Tamara Rojo, James Streeter, Jeffrey Cirio et al. Akram Khan choreographs this live performance of Adolphe Adam's work by the English National Ballet recorded in 2017. Tamara Rojo performs the title role with the rest of the cast including James Streeter, Cesar Corrales and Stina Quagebeur. 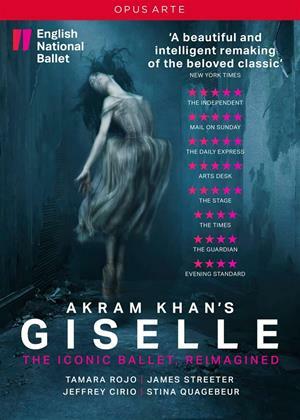 'Giselle' has become a former garment factory migrant worker. Albrecht, a member of the wealthy factory-owning class. An abandoned 'ghost factory' haunted my the memory of female migrant workers, many of them victims of industrial accidents, replaces the traditional glade of Act II. There, Giselle's desire to break the cycle of violence will lead her to reconciliation with Albrecht and his release from the retributive justice of the Wilis.